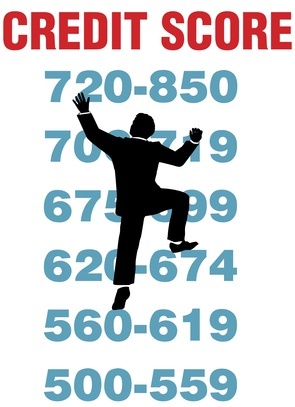 Whether we like to admit it or not a little three-digit number rules our credit life that’s called our credit score. If you have a good credit score of, say, more than 750 you should be able to get just about any type of credit you apply for and at a good interest rate. Conversely, if your credit score is down in the dumps at 580 or less, you will have a hard time getting any new credit and if you can it will have a pretty stiff interest rate. Maybe you have never seen your credit score or haven’t seen it recently. If this is the case, you should get it immediately. The score that your lenders use when deciding whether to give you credit is called your FICO score. The only way you can get it is on the site www.myfico.com where you will either have to pay $19.95 or sign up for a free trial of the company’s Score Watch program in which case you will get it free. However, there are other options. The site www.CreditKarma.com will give you your credit score free but it won’t be your true FICO score. This includes your credit score, a way to monitor your credit health, plus the ability to track your progress against your credit goals. It’s also possible to get your credit score from the three credit reporting bureaus – Experian, Equifax and TransUnion – though you may have to jump through some hoops in order to get it free. And again, this will not be your true FICO score. Of these five components, two make up 65% of your credit score – your payment history and debt vs. credit available. As you might guess, your payment history is based on how well you’ve handled credit – that is have you made all of your payments and on time. Debt vs. credit available, which makes up 30% of your credit score is really the amount of debt you have available versus the amount you’ve used. This is called your debt-to-credit-available ratio. Say that you add up all of your available credit (your total limits) and got $10,000 but had total debts of $8500. In this case your debt-to-credit-available ratio would be 85%, which would be too high and would make you look very risky to any new lenders. So a quick way to boost your score is to pay down your debts, which would immediately improve your debt-to-credit-available ratio. Of course, paying down your debts can be easier said than done. In fact, if you could really pay down $3000 or $4000 of debts quickly, you probably wouldn’t be having a problem with debt in the first place. But there is an alternative. You could contact your creditors and ask them to raise your credit limits. Of course, if you had a debt-to-credit-available ratio of 85%, you might have a hard time convincing them to raise your limits. Some will and some won’t. But what you could do and here comes the sneaky, little trick is to get what’s called a sub-prime merchandise card tied to a line of credit that would allow you to buy merchandise from a single wholesale distributor. The thing is that everyone who applies for one of these cards is automatically approved. The distributor becomes the one who is supplying the financing because it wants your business. Of course, you shouldn’t get the card just so you could start racking up more debt. What you want is a new line of credit that the distributor will report to the credit-reporting bureaus. Let’s suppose you get a $10,000 line of credit on a subprime merchandise card. This boosts your total credit limit from $10,000 to $20,000. Your debt- to-credit-available ratio immediately drops from 85% to 42.5% and your credit score should increase accordingly and dramatically. Of course, the real trick is that you need to know where to go to get one of these cards and this may take some work. The problem is that these cards are marketed almost exclusively via email, telemarketing and direct mail. This is so they can make almost irresistible offers such as “$5000 credit cards – guaranteed! ..no credit check, … no co-signer … you cannot be turned down … everyone approved,” etc. 1. It will, as noted above, increase your credit limit by the $5000 or whatever amount almost overnight and will look like any other unsecured revolving credit account. 2. Because you would be carrying a small amount of debt this would positively impact your credit report and show potential lenders that you are credit worthy. 3. If are sensible in how you use the card, you should eventually receive “legitimate” credit card offers in the future as other lenders rent your name from the credit bureaus.